This is a Tin Man costume I made for a friend. I made out of silver poster boards, gold brads that I spray painted silver, yellow dish gloves I also spray painted silver, Velcro and hot glue. I made this without a pattern, just by looking at pictures of the tin man. I also made his oil hat and axe with poster boards and hot glue. I hope you enjoy this picture as much as I enjoyed making it. I love a challenge!! What did you put on your face? Looking to make for my toddler, how did you piece everything together, with glue? And how does he put it on? Would you be interested in making another? If so, what would you charge? Ajp, I'm sorry I don't make them to sale. Is this costume for sale? I know it's been a while, but would you be willing to type up a quick how-to? 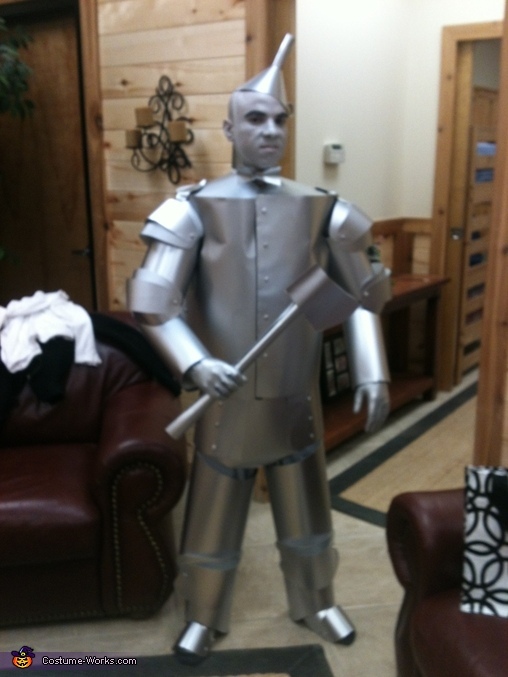 My husband needs a tin man costume for a work function in a couple weeks and I think yours looks fantastic! Most of the other ones I've seen require all kinds of sewing, and that's just not in my bag of tricks. Any help or advice would be appreciated.